See notes for fitting. 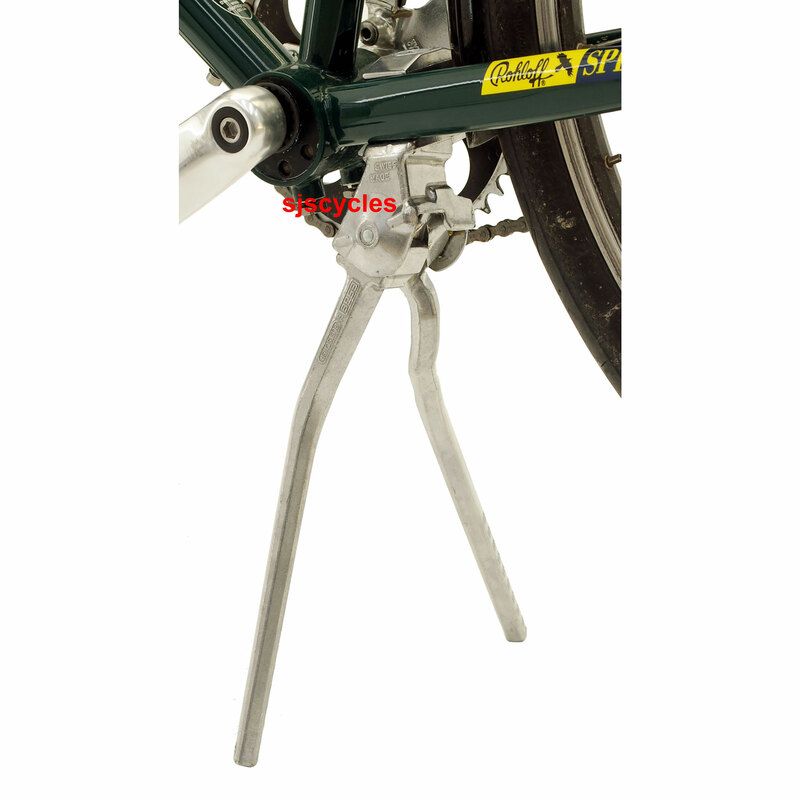 For 26 inch wheels, similar to a motor bike’s centre stand. Supremely stable when parked. 600g, folds away to one side when not in use. NOTE>> Voids Thorn frame warranty, may crush chainstays if overtightened or the bike is heavily loaded or leaned on. ConsLack of instructions on fitting and cutting to length. My Thorn Raven Tourer with back and front loaded panniers has fallen over so many times on camp sites that I have lost count. Good job the bike takes blows so well. I have tried Hebbie centre stand and kick stands of all makes on the bike but nothing seemed to work. Not sure that I would trust it with a fully laden bike on grass but so far I am impressed with this stand. The one big let down is the fitting instructions with only a handful of pictures to guide you. However the real let down is that there is no guidance on how to cut the legs of the stand to fit your bike. I did mine in very small cuts until it fitted. I changed a single leg propstand for this Pletscher twin leg on my Raven Tourer. Local police bikers had demonstrated their, very positive, action for me. I found it very simple to fit and the quality of materials gives confidence. Before, I found it difficult to stand the bike when loaded for touring - that it is no longer a problem. I help to maintain cyclepaths, some on canal towpaths, requiring both a loaded bike and frequent stops - the change has made this task much more straightforward. I'm glad to have made the change. Would this stand be too short for my bike? This is advertised for bikes with 26" wheels, however I have a mountain bike with 26" wheels and am unsure if it will fit? I have just measured the bottom of the chain stay (where stand would be clamped to the bike) to the floor, and the distance is 300mm. As this stand only says 290mm, would this be too short? What does the 290mm mean? In light of my 300mm measurement, should I go for the next size up, despite this saying it is for 700cc wheels. What would you recommend I buy? This stand will be fine, you will need the stand to be slightly shorter to allow the bike to lean onto it slightly. Does the twin-leg stand come complete with plastic feet or must I order those seperately? This stand does not come with any plastic feet so you'll need to order those separately if you would like to fit them. This stand comes with the top plate and a set of plastic bushes.